FORT BRAGG, N.C. — In an unexpected move, Army Sgt. Bowe Bergdahl took the stand in his sentencing hearing Monday, breaking down several times and apologizing to those who were wounded while searching for him after he abandoned his post in Afghanistan. "I was trying to do something good and it turned bad," Bergdahl said, reading from a statement at the beginning of his testimony. "My words alone can't relieve the pain ... I think about what I did every day for the last eight years." Aside from when Bergdahl pleaded guilty to desertion and misbehavior before the enemy, it was the first time the courtroom had heard from him. His appearance came as a surprise to courthouse reporters, who were told another witness would be testifying Monday afternoon. Bergdahl abandoned his post in Afghanistan on June 30, 2009, and then was captured by the Taliban. On Monday, he detailed several unsuccessful escape attempts. He started crying multiple times, at one point shaking his head, too overcome with emotion to answer a question about his captivity from the defense. Bergdahl's testimony came on a busy day in court, which began with the military judge who will be deciding his sentencing denying a motion by defense attorneys to dismiss the case based on comments made by President Donald Trump. The court also heard heart-wrenching testimony from the wife of a soldier seriously injured in the search for Bergdahl. "He’s lost me as a wife, essentially, because instead of being his wife, I’m his caregiver," said Shannon Allen, the wife of Master Sgt. Mark Allen, who was shot in the head. "I mean, we can’t hold hands anymore, unless I pry open his hand and place mine in it." A contrite Bergdahl addressed those who were injured looking for him, ended his opening statement with: "Thank you for your sacrifice." Bergdahl was not cross-examined by the prosecution, only questioned by the defense. His testimony came hours after the judge, Col. Jeffery Nance, said he would not grant the defense's request to dismiss the case. Nance said Monday that Trump's criticism has not prevented Bergdahl from having a fair sentencing hearing, and said he is "completely unaffected by any comments" about Bergdahl. However, he added that he will consider Trump's comments as a mitigating factor when he hands down Bergdahl's sentence. Bergdahl faces life in prison. He was released in 2014 in a prisoner swap arranged by President Barack Obama. The deal was criticized by Trump and other Republicans. While running for president, Trump disparaged Bergdahl, 31, as a "dirty rotten traitor" and called for him to be executed by firing squad or tossed out of a plane without a parachute. Nance temporarily halted the sentencing hearing after seeing a video of Trump on Oct. 16 referring to his campaign trail comments in which he said he couldn't talk about Bergdahl, but added, "But I think people have heard my comments in the past." 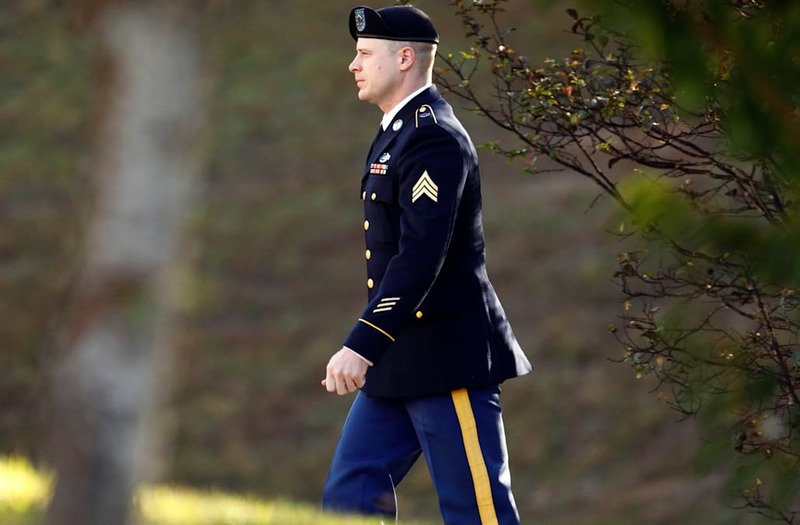 The prosecution hopes to prove that Bergdahl's desertion endangered those who went looking for him and presented the wife and doctor of Mark Allen, the soldier shot in the head, earlier Monday. Allen uses a wheelchair and a feeding tube and cannot speak. Shannon Allen told the court that Mark was "always happy-go-lucky" before he got shot and was an active dad to their son, Cody, and daughter, Journey. She said he coached baseball and said they planned on having more children. Now, Shannon said, "his involvement is much more passive." "He’s present, but he’s not able to have any real physical interaction," she said. While Allen can make eye contact, laugh, smile, and cry, he's unable to express his needs in any way, she continued, adding that she has to guess if he's experiencing a health problem and they often end up in the emergency room. He can't be left alone, she told the court: "It's like leaving an infant." Dr. Rafael S. Mascarinas III, the attending physician at a VA rehab center in Tampa Bay, Florida where Allen stayed from August 2009 through December 2011, testified that Allen has had multiple surgeries to remove parts of his brain and has had strokes in different parts of his brain, Mascarinas said. Shauna Williams reported from Fort Bragg, and Elizabeth Chuck from New York.